Anglers come from the world over to fish in Montana. And happily, Montana has very “wade friendly” waters to fish. Unfortunately, these wade friendly areas tend to be quite crowded and fished heavily since most wade friendly areas are very accessible. Because of the crowds, more and more anglers are turning to using a fishing boat to reach quieter areas on Montana’s famous rivers. Reach Inaccessible Areas – This should go without saying, but with a fishing boat, you can reach areas that a wade angler could never reach. Cover Far More Water – This is one of the greatest assets of a fishing boat – to cover large amounts of water during a day. While this isn’t always a good thing (its all too easy to blow right by a good area without knowing it), by and large, its usually better to cover more water than not. Besides, with a boat, you can float to good water and then start to wade fish – giving you the best of both worlds. Fish in Low Pressure Fishing Areas – Ever fish around a busy fishing access site in Montana? The fish tend to be very spooky, due to all the commotion and the frequency of anglers hucking flies their way. By hopping in a boat, you can reach areas on a river that see greatly reduced fishing pressure. Fun – Yes, fishing is lots of fun. But you know what, so is floating. Even when the fish ignore you, there are far worse ways to spend a day than floating a scenic Montana river. This section, however, doesn’t cover “everything that floats.” Instead, this section on Big Sky Fishing.Com introduces anglers to the various boats that are dedicated to fishing. Some boats are traditional, such as the drift boat. Others are inflatable, such as the new generation of inflatable fishing kayaks. Always remember that before purchasing a boat, it is crucial to determine what type of fishing you’ll be doing and where you’ll be doing it. A beautiful drift boat won’t do you any good if you don’t have a trailer to haul it and if there isn’t a boat ramp available at your favorite fishing hole. 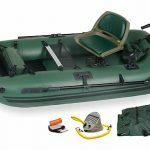 Inflatable rafts make superb fishing platforms, both on the lakes and in the rivers. 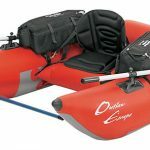 This is doubly so if the raft has been enhanced with features anglers demand, such as comfy seats, rod holders, motor mounts and trolling motors. 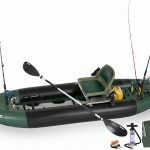 These inflatable kayaks are specifically designed for fishing. 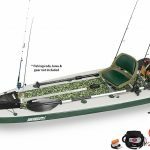 Kayaks typically include rod holders, storage pockets and many other fishing necessities. Yet these kayaks can do more than just go fishing. They are just as tough and as durable as Expedition level kayaks. The quintessential fly fishing boat, the pontoon boat is the most popular choice for serious fly fishing. Lightweight, portable and extremely functional as a fishing platform, the pontoon boat has been taking anglers across lakes and down rivers for decades. While these boats are not for recreational floating, they are excellent fly fishing platforms. 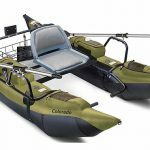 Lightweight and truly portable, float tubes are decent fishing platforms for people who need portability above all else. Designed specifically for fishing, float tubes aren’t especially versatile. Drift boats are the quintessential fly fishing boat. Primarily used by fly fishing guides to take their clients out on the water, drift boats are superb fly fishing platforms. 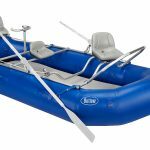 A whitewater fishing raft is basically a whitewater raft with a fishing frame installed. The fishing frame allows for extreme customization of the raft to meet a person’s fishing needs. A surfboard for fishing? Well, yes. One of the newest dedicated fishing “boats,” inflatable SUP’s that have been specifically designed for fishing do have their unique uses. Not an ideal “boat” for a Montana river, but it comes into it’s own in shallow waters and large open bays.